2017 marks Book Clubs for Inmates’ tenth anniversary of transforming lives through the power of books. The board of directors of Book Clubs for Inmates is delighted to announce that Founder, Carol Finlay, received a Meritorious Service Medal (blue medal in photograph) on Friday July 6, 2018. PHOTO CREDIT: SGT JOHANIE MAHEU, RIDEAU HALL © OSGG, 2018. Her Excellency the Right Honourable Julie Payette, Governor General of Canada presented the Meritorious Service Medal (Civil Division) to Carol Finlay, O.Ont., M.S.M. at the ceremony at the Citadelle of Québec. As Carol says, “ I accepted this award on behalf of all the wonderful volunteers and financial supporters of BCFI, without whom none of the work of BCFI would be possible." We at BCFI are very pleased to announce that we have been recently become members of NAACJ (National Associations Active in Criminal Justice). The goal of NAACJ is to enhance the capacity of its member organizations to contribute to a just, fair, equitable and effective justice system. BCFI joins 19 other member organizations who are national in scope and who represent a diversity of groups engaged in the field of criminal justice. This diversity covers a variety of areas, including non violent conflict resolution, transitional housing, law, research, advocacy, policy , training, literacy, counselling and restorative justice. Membership offers us the opportunity to engage with other community based justice related organizations, Correctional Service of Canada and Public Safety in a more co ordinated and effective manner. 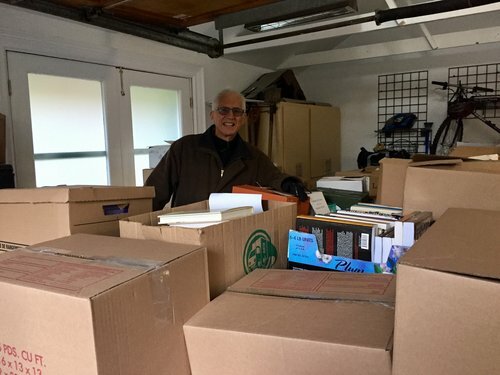 BCFI is thrilled to thank Thomas Heintzman OC, a retired litigation lawyer, who collected nearly 4,000 books from neighbours, colleagues, and friends during a month-long book drive for Beaver Creek Institution's library. Tom sent out over 200 emails asking for donations of the books requested by inmates, and also collected dictionaries, reference books, text books, cook books, and more. Today, Thomas loaded the books into a moving truck and drove them up to the library. Many thanks to everyone who donated books! Thank you, Tom!